Home » Tools » Have You Heard of the app Stop Breath Think? Have You Heard of the app Stop Breath Think? What is it? 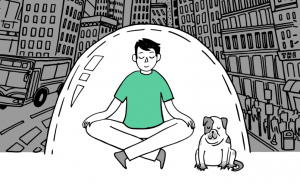 Stop Breathe Think is a free app that allows people recognize their emotions and rejuvenate quickly. You identify your emotions and then select a recommended guided meditation. Who uses it? Anyone who experiences stress, anger or frustration. All students, parents, teachers, entrepreneurs and leaders could benefit from tools that enable their own well-being. How can it help? It allows you to be at your best. It can enable you to recover quickly when things don’t go as planned. As innovators, we need to be positive in the toughest situations and this tool could help us develop that resilience. The meditations are also based on compassion and mindfulness which are central to being an innovative leader. Why I use it? I can get overwhelmed with too much to do and lose the joy of serving in a cause. The simple app and meditations enable a calmness and connection back to the purpose behind what I am doing. ← Have You Heard of Fotojet?